How Many Books Does It Takes To Change A Light Bulb? Find out how IHS Markit can help you and your team reduce research inefficiencies, cut costs, ensure safety and deliver products to market up to four months faster. Today’s engineers face an unprecedented wave of technological change. Discover the top 8 transformative technologies and their impact on the engineering discipline. Can transformative technology blockchain improve traceability of components and electronic systems? Learn more about the promise of blockchain and considerations before adopting as a secure solution for traceability. What are Late Product Launches Really Costing You? New product introductions risk lost revenue and market share without processes to effectively collaborate and share information. Learn the major issues facing engineering executives – including revenue, organizational capabilities, innovation, risk and cost – and pathways to addressing those challenges. The Lifecycle Insight blog provides digestible insights on how technologies work and what it means for you. In this post, industry analyst Chad Jackson reviews Engineering Workbench capabilities and advantages, and provides commentary and analysis on why this is a big deal for engineers as problem solvers, companies going through mergers and acquisitions, and enabling long term archival. Glean insights from patents to identify new innovation solutions and processes. Patents can provide valuable insights into not only the solution being patented, but the problem being solved. By incorporating patent intelligence into decision-making, engineers can improve and enhance innovation processes. A leading global manufacturer of medical devices taps world-class knowledge discovery tool to slash research time by ~30% while also accelerating innovation and increasing patent filings. Engineers waste 30+% of their time duplicating work or repeating past mistakes. That’s because finding and accessing information scattered across an organization is difficult at best. IHS Markit Engineering Intelligence platform, Engineering Workbench, recognized as leader in Standards management in Outsell's latest Global Standards Report. While companies might assume that their PLM systems will satisfy their need for extracting information to support the adoption of ISO 15288, that is often not the case. See how energy companies are identifying their high-cost/high-spend procurement items (such as valves and casings) and saving millions by eliminating over-specification. Companies are asking their engineering teams to deliver more value with fewer resources. Learn what leaders do differently to stay ahead of laggard competitors. When companies come together, 44% of them have no knowledge-transfer process ready and 70-90% of M&As fail. See how engineering intelligence can reduce risks. While data is proliferating, 54% of engineering decisions are based on inadequate information. Now industry is turning to technical knowledge management solutions. Automakers can strengthen Failure Modes and Effects Analysis (FMEA) with better integrated systems and knowledge management, says Vasanth Krishnaswami at IHS Markit. Knowledge workers spend 42% of their time seeking, processing and sharing information. 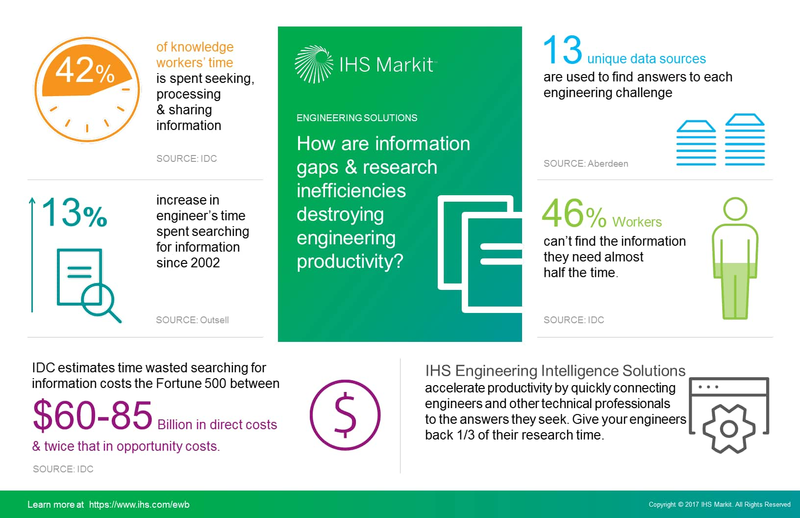 IHS Markit can help you give your engineers back a third of their time. By demonstrating the benefits of conforming with industry-standard valves, IHS Markit helped an oil and gas company save $25 million annually in procurement costs. By adopting a centralized knowledge solution, Airbus Defence and Space engineers cut research time by 30% and expedited problem-solving for a space rocket program. By infusing knowledge into your change management process, you can reduce product development cycle time by 33%. NASA engineers used an advanced knowledge research tool to apply lessons from Apollo to fix Orion’s upright landing system, saving years and millions of dollars. Engineers spend about 25% of their time looking for information but find what they need only 56% of the time. Industry leaders (e.g. Boeing) turn to IHS Markit. A typical change order in the design phase costs $2K but skyrockets to $11K in the manufacturing stage. Get the tools you need to accelerate change orders. Given that most devices and networks can be hacked, how do engineers design mission-critical systems while simultaneously ensuring safety and security? An act as seemingly harmless as downloading fact sheets from a supplier website can open up your organization to huge risk. Learn to find vetted technical content. The latest release of this top engineering intelligence solution adds advanced standards management capabilities to cutting-edge knowledge discovery and content analytics. Is your engineering productivity at risk? Engineers waste 40% of their time looking for information, often to redevelop existing inventions. IHS Markit can get your engineers back on the productivity track. With up to 50% of the energy workforce set to retire in seven years, companies looking to preserve revenues must successfully transfer expert knowledge to the next generation. Monroe Energy, a Delta Air Lines subsidiary, used a technical knowledge solution to slash its parent company’s jet fuel costs and reap efficiency gains of nearly $600K per year. The race to innovate: Where do you stand? Bringing better products to market faster is critical for revenues and, ultimately, survival. Is your organization keeping pace? Jim Belfiore, managing director of client innovation services at IHS Markit, says increasing competition is forcing product manufacturers to look beyond their traditional markets. Engineering risks can be quantified in multiple ways but mitigated with one platform. Is your organization equipped to combat risk? What are the top five challenges engineering leaders face? Chad Hawkinson, senior vice president of product design at IHS Markit, finds common themes when speaking with heads of engineering worldwide. 2017 ASME Boiler and Pressure Code: What’s new? The 2017 ASME Boiler and Pressure Vessel Code edition is due for release mid-year. Learn about key changes and their impact on boiler pressure professionals. Experts predict the loss of experienced personnel will cost the energy industry $35 billion/year in wasted upstream expenditures. How prepared is your organization? Learn how a NASA engineer used knowledge discovery software to go from days to mere hours when finding a possible solution to a malfunctioning Orion rocket system. PLM systems help industry leaders implement design decisions but new solutions can help you make better decisions at the front of the process, saving time and money. IHS Markit and Supply & Demand Chain Executive magazine surveyed top innovation experts. Find out what we learned. A snack food market leader connected R&D systems and now finds documents in seconds versus days, reducing time for a routine patent search from 2 weeks to 1/2 day. Whether the goal is fuel economy, sustainability or faster performance, engineers in many industries are addressing the need to integrate lightweight components into their designs. A global energy firm asked for help reviewing internal and international standards. Research found $180 million in potential annual savings for improved conformance. Find out which risks confront engineers today and how organizations can mitigate those risks while also making their teams more efficient and productive. Track new developments and anticipate future trends in engineering intelligence. Receive information and insights from the experts at IHS Markit. Do you want to boost engineering productivity by up to 33%? Find out about a new innovation platform that pairs unified access to internal/external technical content with analytical capabilities and problem-solving tools. reduce risk and foster innovation. Just fill in the form, and we will be in touch soon.